Eileen Ruth Burns of Litchfield, Connecticut died on Thursday, June 14, 2018. Eileen was born on 11/13/1929 to Frederick and Ella Whitehead in Bellerose Long Island, New York. She moved with her parents, sisters and brother to their home in Milford, Connecticut where she spent a happy childhood and made that town her place of residence for several decades. She met her future husband Frank C. Van Ormer Sr. and married in 1954. The couple resided in the Devon section of Milford, Connecticut where they had three children, Alice, Frank Jr., and John. In 1966 her husband, Frank, died suddenly leaving her widowed with her young family. She continued to reside in Devon until her youngest son began to attend school at St. Ann Parochial School in Devon along with his two older siblings. Eileen reentered the work force as a secretary while maintaining the household, participating in the children’s school activities and as circumstance allowed taking the family on summer vacations to Cape Cod. Finding love once in one’s life is considered a blessing. Eileen felt she had been twice blessed to have met and eventually marry her present husband, Edward R. Burns in 1971. As a couple they spent the next 46 years together in Litchfield, Connecticut. Eileen and Ed had a fourth child, Joel Burns, and with their family of six have made Litchfield, Connecticut their permanent home. Eileen became very active in participating in community affairs both in Litchfield and in nearby Torrington, Connecticut. Her commitment to social service activities and organizations have included a member of the Book Selection committee at Oliver Wolcott Library; coordinator of the Thresholds Educational Program at Litchfield Correctional Center; Co-founder of Friends of Hospice, a fundraising organization to support Hospice at Home patients in the Litchfield, Torrington and Harwinton area; Executive Director of the same agency, a position she held for many years; Chair Person of the board of directors of Catholic Family Services in Torrington, Connecticut; member of the board of directors for Catholic Family Services of the Arch Diocese of Hartford, Connecticut; member of the board of directors at Wisdom House in Litchfield, Connecticut; president of the Visiting Nurse Association of Litchfield, Connecticut. In 2009 she was recognized and honored for her outstanding community service by being nominated to receive the annual Wisdom House Award at Wisdom House in Litchfield, Connecticut. Eileen was a remarkable woman. She considered her life a wonderful gift which she lived generously, joyfully and with an ever welcoming spirit of hospitality. She looked to her past with gratitude and thanksgiving and to her unknown future with confidence, hope and an insatiable curiosity. She will be greatly missed by her family and her many friends whom she met and cherished throughout her life’s journey. Eileen is survived by her husband Ed, her children and their spouses; Alice A. Van Ormer of Ayers, MA, Frank and Sue Van Ormer of Torrington, CT, John and Lee Van Ormer of Southport, NC, and Joel and Emily Burns of Merrimack, NH. She has ten grandchildren and 14 great grandchildren. She is also survived by her sister Jaqueline Musante of Easton, CT, along with numerous nephews and nieces. Calling hours for family and friends will be held at Rowe Funeral Home in Litchfield from 4:00-7:00pm on Sunday, June 17, 2018. A Mass of Christian Burial will be celebrated at St. Anthony Parish in Litchfield at 10:30am on Monday, June 18, 2018 followed by burial in St. Anthony Cemetery in Litchfield. In Lieu of flowers, donations may be made to Friends of Hospice, the Visiting Nurse Association both of Litchfield, or the Torrington’s Soup Kitchen, Torrington, Connecticut. Kindly visit www.rowefuneralhome.net to send the family an online condolence. 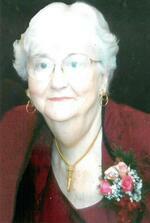 To send flowers to the family of Eileen Ruth Burns, please visit our Heartfelt Sympathies Store.